John Clem was born on august 13, 1851. 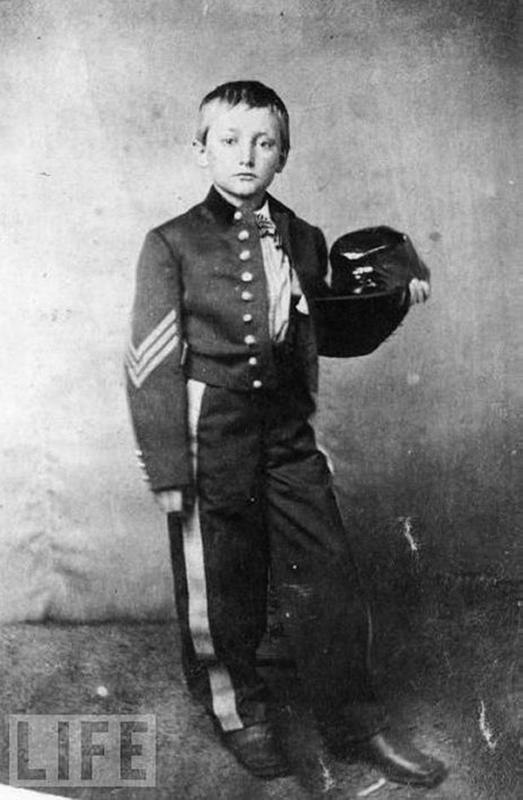 On April 12, 1861, at the outbreak of the Civil War, he was only nine years old. Less than a later, he attempted to enlist in the union army. He was turned down by both Ohio and Michigan regiments because he was too young, and the fact that he was small for his age, looking more like a six or seven year old. John was not discouraged by the rejections, and decided to march with the army anyway. Army officers soon took notice, and decided to adopt him as an unofficial drummer boy. The officers chipped in to pay him the regular soldier’s monthly wage of about 13 dollars. In 1862 at the Battle of Pittsburg Landing, John’s drum was hit by an artillery shell, and the press dubbed him "Johnny Shiloh". He was finally allowed to officially enlist in 1863. Soon afterward, his regiment customized a rifle for his size, and he began to march as a full-fledged infantry soldier. In the fall of 1863, John was captured by Rebel soldiers in Georgia while guarding a train. The Rebels took his uniform away, upsetting the boy terribly; he was particularly upset at losing his cap which had three bullet holes in it. He was released later in a prisoner exchange. Clem went on to fight in a number of battles and was wounded two times. The February 6, 1864 issue of Harper’s Weekly carried the story of the brave little soldier: SERGEANT JOHN CLEM. OUR YOUNGEST SOLDIER. SERGEANT JOHN CLEM, Twenty-second Michigan Volunteer Infantry, is the youngest soldier in our army. He is 12 years old, and small even for his age. His home is Newark, Ohio. He first attracted the notice of General Rosecrans at a review at Nashville, where he was acting as marker of his regiment. The General, attracted by his youth and intelligence, invited him to call upon him whenever they were in the same place. Rosecrans saw no more of Clem until his return to Cincinnati, when one day coming to his rooms at the Burnet House, he found the boy awaiting him. He had seen service in the mean while. He had gone through the battle of Chickamauga, where he had three bullets through his hat. Here he killed a rebel Colonel. The officer, mounted on horseback, encountered the young hero, and called out, "Stop, you little Yankee devil!" By way of answer the boy halted, brought his piece to "order," thus throwing the Colonel off his guard. In another moment the piece was cocked, brought to aim, fired, and the officer fell dead from his horse. For this achievement Clem was promoted to the rank of Sergeant, and Rosecrans bestowed upon him the Roll of Honor. He is now on duty at the head-quarters of the Army of the Cumberland. 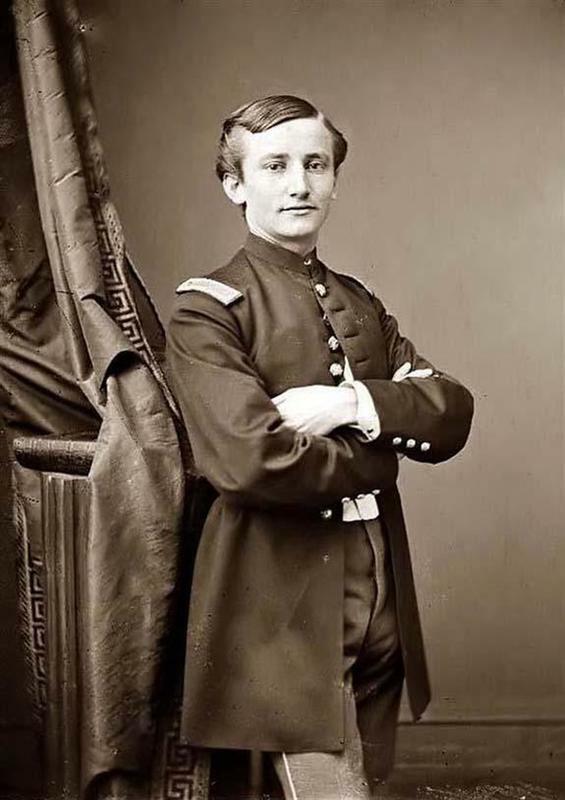 At the tender age of 12, John Clem had had his drum shot off at Shiloh, his hat shot off at Chickamauga, had killed a Confederate Officer in combat, was wounded two times, had been a prisoner of war, and was the youngest non-commissioned officer in U.S. Army history. John Clem Retired from the U.S. Army as a Major General in 1916 after the start of World War I. He was the last Civil War veteran on active duty in the US military. Major Clem died in San Antonio on May 13, 1937, and was buried in Arlington National Cemetery.